People of all cooking abilities and ages read this site. As such, I sometimes like to cover basic technique. I don't fry a lot, but occasionally, we like fried chicken tenders, fish, zucchini or eggplant for eggplant parmesan. 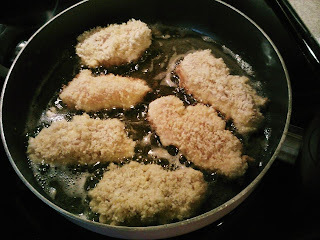 There is a method to get good results when frying; a method where your breading will stick to your food and not fall off in the pan. (1) Choose the right oil; a oil that will not break down or smoke when frying. Canola oil, safflower oil, sunflower oil, and peanut oil are preferred; but even vegetable oil is good. (2) Before breading, dry the extra moisture off of your food by patting it with paper towels. (3) Preheat your oil. I usually use medium high heat. Oil between 350 and 375 degrees is optimal for frying. The amount of oil should just cover the bottom of the food. (4) Prepare your breading. I always bread my food with seasoned flour, egg and the breadcrumbs; in that order. I usually use Japanese Panko Breadcrumbs for frying. They have a great texture and stick to food well. (6) Dip your item in beaten egg. Coat it well and shake off the excess. 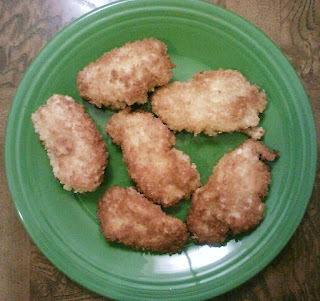 (7) Dip your item in breadcrumbs. (8) Cook several minutes per side until the bottom is golden brown. Flip and repeat. If you don't have a temperature gauge; how do you visually know the oil is ready? If you put a piece of flour etc in the oil and the oil bubbles around it - it is a good indicator it is ready.